When it was created, the founding Charter of the United Nations was supposed to introduce a unique system, based both on a desire for international and multilateral cooperation in which each State, regardless of its geographical and/or diplomatic importance, has a voice, but also impregnated with a strong predominance of world powers at the end of the Second World War. The five countries that have participated most in the conflict and the construction of the UN are the powers that still occupy, as a totally accepted anachronism, the five permanent member positions of the Security Council of the international organization. 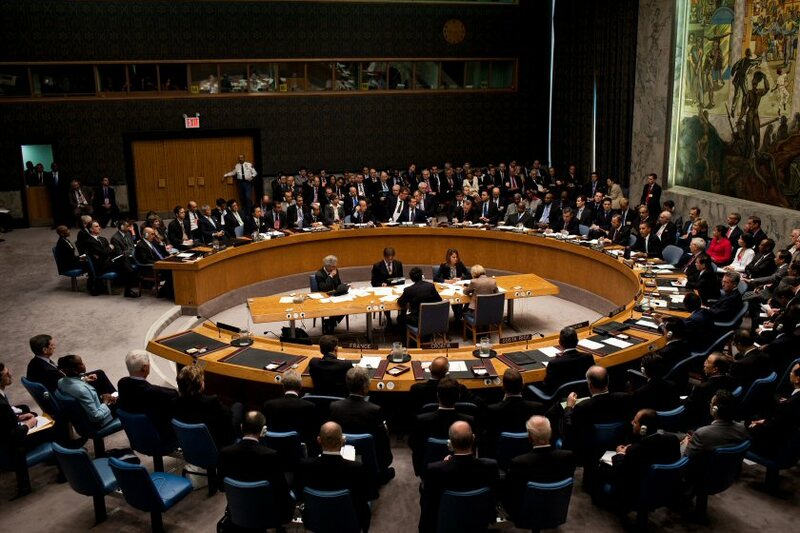 The Security Council is the principal decision-making organ of the United Nations and thus is committed to assume the primary responsibility of the organization introduced by Article 14 of the Charter, the very reason for its existence: “the responsibility for international peace and security”. However, this noble task often seems to contradict the national economic interests of these same five countries, particularly when we see that they are, and have been for decades, the most prolific arms dealers on the international scene. From year to year the ranking never is regular, but you can be sure that the protagonists are always the same. First, it is China and its flashing militarization that frightens, a classic. Then, more surprising, it is France that moved up in the ranking by selling a flock of Rafale to the first country, generally paying little attention to human rights, which would feel the need for a hundred of warplanes in peacetime. Sometimes it is UK’s turn by keeping its weapon supply to Yemenite repression against Houthi rebels, or even by selling war equipment to Arabia Saudi while they are suspected by UNO of “potential war crimes” here again in Yemen. Finally, the grand finale, Russia and the United States, the two largest arms exporters in the world, who are almost jealously competing for first place in the ranking, as if we were still in the middle of the Cold War. Between 2001 and 2005, Moscow is the one that is doing well, with more than 31% of world exports. Between 2009 and 2013, the Americans reacted, of course, and came back in the lead, again with more than a quarter of total international sales. Both countries are obviously using these sales to establish zones of diplomatic influence which surely is not good news for the construction of long-lasting peace in some areas. On the basis of these considerations, some are outraged, and others retort that trade only concerns national interests and thus does not influence the peace-keeping mission of these arms giants. Is the paradox emerging in your mind? This old warmongering maxim of “to have peace, prepare for war” therefore retains all its relevance for many, but has it shown its evidence? Let’s take India and Pakistan, since 1947 the French equipment has been shining on the battlefields, on both sides. Knowing that the two countries raised of intensity in their their attacks until the 2000s, in line with the technical developments in French armaments, it is possible to doubt the pacifying power of these various Mirage, Mistral and other ever more powerful ballistic equipment. Such examples, today and in History, there are thousands of them, and they still involve these same five countries of the Security Council. However, we are still wondering whether or not this fruitful trade influences world peace. For decades analysts have been proposing to ask us the question of the societies’ militarization as an essential element of international conflicts, but we prefer to continue to go blind, because let’s be honest, build an aircraft carrier and sell it to a country full of oil, this is lucrative. Thus, nowadays it is not going too far to declare the Security Council’s peacekeeping strategy, if there is one, a failure. Ole Wæver’s notion of “security” seeks to de-essentialize the idea of security, not to consider it as something that would live or pre-exist in the discourse on security. From this perspective, a situation only becomes a security problem when it is labelled as falling within the scope of security. In the light of this idea, it appears that the question of weapons sales by “legitimate”, “good” countries, particularly those of the Security Council, is not really raised as a matter of international security. Yet it is when people’s security and life are sacrificed on the altar of economic profit that we can begin to worry. Peace, true positive peace, not as the absence of war but as the establishment of economic and diplomatic structures aimed at conflict resolution, is the only real goal that any country concerned about the well-being of its citizens should pursue, and in its experience, humankind can testify that weapons have never helped in this regard. Previous post Artificial Intelligence: towards the return of the empires? Next PostExercise Trident Juncture 2018: a provocation to Russia?